This inexpensive machine cleans impressively and has a great spin cycle. If you’re in the market for an inexpensive freestanding washing machine that washes and spins exceptionally well, is simple to use, and comes with heaps of handy features; you might want to give the Bosch WAN24100GB a moment of your attention. This model from Bosch comes with dimensions of 84.8 cm (H) x 59.8 cm (W) x 55 cm (D) and a maximum load of 7 kg, making it an adequate size for most medium-sized households or families. The door opening is a bit tight and might cause minor irritation if you’re trying to fit in a duvet. It has a spin speed of 1,200 rpm and 15 wash programs, ranging from delicate items and wool to cotton and man-made fibres. There’s a quick wash programme for those in a hurry, an extra-quiet night cycle, a shirt cycle, anti-allergy options, an eco-cycle, and many more. On the front you have a nice LED display to let you see how the programme is progressing, while an anti-vibration design is said to reduce shaking and noise. ActiveWater cleverly devises the optimum amount of water that’s needed for your load size, saving money and helping to protect the environment. In the meantime a 3D Aqua Spa feature guarantees all your detergent is successfully washed out of your fabrics. It’s got a reload function if you need to pause the cycle to add a forgotten item, and a 24-hour delay timer if you want to postpone your wash till later. The performance of the Bosch WAN24100GB is something to behold. It cleans brilliantly, as evidenced by it’s A-rating for wash performance. You can rest assured your clothes will be perfectly clean and ready for the clothes line or tumble dryer, although if you were to quibble the rinse cycle is fairly average. This isn’t a super quick machine, and the cotton cycle takes almost three hours to complete, but this is a small price to pay for its superlative cleaning capability. Finally, this model is energy efficient with an A +++ rating, and washes quietly at 54 dB. However, the spin cycle creates a less tolerable 74 dB of noise, enough to raise voices if you’re in the same room. Why you should buy it: UK buyers will be pleasantly surprised if they buy this inexpensive gem from Bosch. 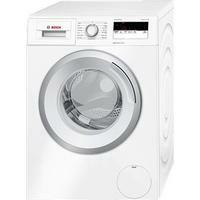 It cleans remarkably well, has a more than decent spin cycle, and comes with great labour-saving features.